Amsterdam Towards the Zuyder Zee. 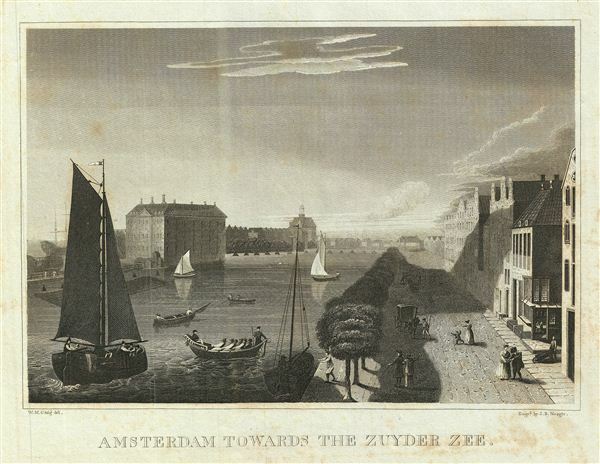 This is an uncommon example of the 1828 view of Amsterdam, Netherlands, drawn by W. M. Craig. It features a lovely view towards the Zuiderzee (Zuyder Zee), a shallow bay in the North Sea. Ships can be seen in the forefront, and people can be seen walking along the tree lined boardwalk. This view was engraved by J. B. Neagle as part of Malte-Brun's System of Geography, Vol. I., published in New York by Samuel Walker.